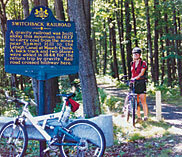 This recreation rail-trail links Jim Thorpe and Summit Hill and features a fantastic overlook on Mount Pisgah. Highlights include interpretive panels that depict what it was like to ride the historic Switchback Gravity Railroad, an old mine shaft, as well as incredible views of the Lehigh Gorge and Jim Thorpe. Along the way, Mauch Chunk Lake Park amenities include camping, fishing, swimming, boating, food and boat concessions. Bike rental and shuttle services available in downtown Jim Thorpe will drop you off at the trailhead in Summit Hill, where you can take the Switchback Trail downhill back into town.